LSF has partnered with Head Start to provide quality early childhood education to children in Duval, Hillsborough, Pinellas, Palm Beach and Belle Glade (PEPPI). LSF’s commitment to early childhood education is simple: to enhance the development of very young children between birth and five years of age (the most critical time of growth) and to promote healthy family functioning. Every child deserves the best start she or he can have, no matter their circumstances. That’s why Lutheran Services Florida (LSF) has, for more than 30 years, provided the highest quality early childhood education to children who otherwise might have been left behind. The first five years of a child’s life are absolutely essential in preparing her or him for a healthy, happy, and successful future. When children receive the quality early childhood education they deserve, not only do children fare better, but communities do, too. 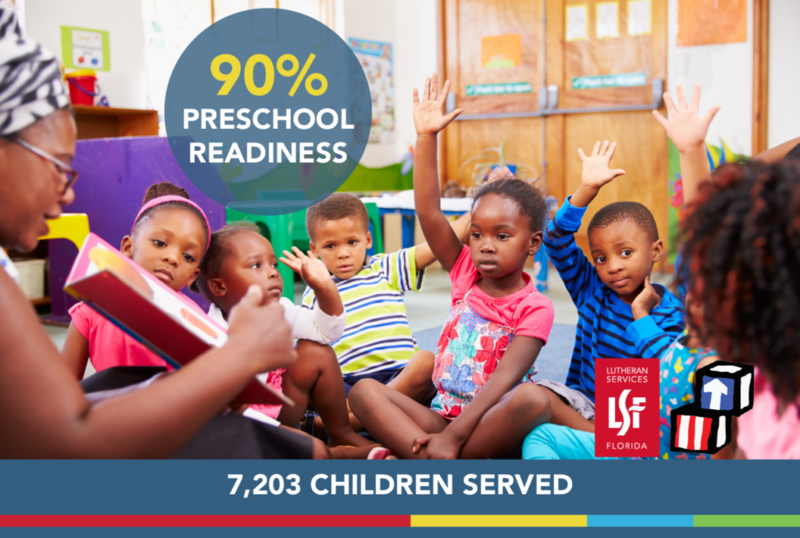 Children in Hillsborough, Pinellas, Duval, and Palm Beach counties are served by LSF. For more than 30 years, we have been the leading provider of early childhood education, offering comprehensive education, family services, disability assistance, and health and nutritional services to all eligible children and families. Parents are pivotal in the success of their children’s futures and to the success of our early childhood programs. Parents take an active role in helping to support and continue learning well beyond the classroom. Parents participate in school activities, volunteer in classrooms, attend special events and trips and assist with ongoing operations in service as committee and board members. If you desire to join one of our parent engagement programs, please contact the main LSF Head Start office in your county or contact your Family and Community Engagement Specialists. is a fatherhood involvement initiative program for the male staff, fathers or male figure that have a positive impact within our Head Start families. The purpose of this initiative is to increase parent/guardian involvement in the Head Start program through center and local program activities that encourages positive child development. This initiative will also help the families by providing resources to participants and their families while helping them understand the importance of father involvement in a child’s life especially in the early development stages. seeks to strengthen, support, and encourage program participants to be resourceful, self reliant, and goal oriented. We acknowledge that women fill very important roles in their households and we will equip them with skills and resources to enhance their lives. Building a successful future requires preparation, knowledge, and accessibility. L.O.V.E. will provide just that!